Turkey Chili Recipe, a great dish for low glycemic diets! A turkey chili recipe is the perfect solution for what to do with low fat ground turkey or left over roast turkey! This chili recipe is a very simple recipe to put together and it's incredibly good. There are a lot of ingredients but you just put them all together and cook. It's great for a low glycemic diet, any diet and it's very flavorful, cheap to make and has very little fat in it. I made this up one very cold evening when we needed something warm, spicy and fast! These are ingredients I happened to have in the house and it was so good I've been making it ever since. There are a few "tricks" to it that make it especially good. Turkey chili is a great low glycemic recipe because it so so filling and can be made ahead on the weekend for more than one dinner during the week. Just add a salad and you're good to go. Double the recipe and you can freeze half of it and you'll have 2 dinners for two people for the week. It tastes even better after the flavors have had a chance to blend. Heat the oil in a 3 quart saucepan and add your onion and minced garlic. As these soften, break up the turkey and stir with a fork into the saucepan. Stir with a wooden spoon and cook until the turkey is cooked through. Drain the meat and add the rest of the fresh vegetables and the spices and cook for 5 minutes. It is very important to both grate and chop the zucchini and the carrot. The texture matters for this dish and this, the spices, and all the other vegetables make the extraordinary flavor zing. Add the beans, tomatoes and olives, cover with a lid and simmer for 10 minutes. Top with the cilantro and serve. There are lots of variations to this turkey chili recipe so give it your own twist. You may want it hotter or more mild by varying the amount of jalapenos and adjusting the cayenne. If you try it with left over roast turkey, remove any fat, cut the meat into bite sized chunks and add it in with the beans. This turkey chili has so much going for it in addition to it's wonderful flavor including that it's extremely high in fiber with the beans and vegetables. A word about ground turkey is in order. Turkey and chicken both have less saturated fat than beef but not many people are aware of how great ground turkey is in this regard. Four ounces of ground turkey contains only about 145 calories and only about 5 grams of fat which is the amount of fat in a teaspoon of butter. Compare that with beef which has 313 calories for 4 ounces and 23 grams of fat or about 4 teaspoons of butter! Ground turkey can be made into patties, put into spaghetti sauce or made into chili. It's an excellent source of lean protein and the amino acid tryptophan which helps with sleep, selenium and vitamin B6. It's also rich in vitamin B3 which helps to control insulin and blood sugar. Altogether it's a great protein source for your low glycemic eating plan. In fact, if you need to be concerned about how much saturated fat you are eating because you are at risk for cardiovascular disease, consider replacing your beef with ground turkey. This amazing turkey chili recipe is the perfect way to eat it! Return from Turkey Chili Recipe to Low Glycemic Recipes. 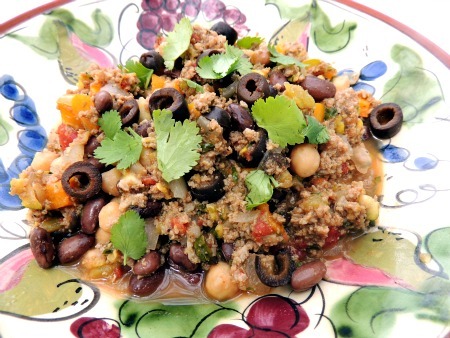 Return from Turkey Chili Recipe to Lifetime Fat Loss home page.